The good points – Newcastle United have qualified for the knockout stages of the Europa League. The bad points – Everything else. What a wake up call…or hopefully it is. Newcastle were second best today and lucky to get away with a draw. Giving something of a lie to Alan Pardew’s pre-match assertion that Newcastle were in this competition to win it. Both Cisse and Ben Arfa hobbled off to leave us all wondering what lies ahead in the coming weeks. Not much good judging by the performances tonight! If you thought Newcastle’s set-pieces couldn’t get any worse…you were wrong, Anita’s delivery was absolutely abysmal – obviously the Ajax school of excellence didn’t rate moves where the ball lifted off the floor. The midfield duo of Bigirimana and Anita were outplayed, out-thought, outclassed, to suggest they are ready to take on the challenge of the Premier League would take some imagination. Ben Arfa and Cisse did show some decent touches in the first half and the striker did look unfortunate with one offside decision going against him but the general play was still all over the place. 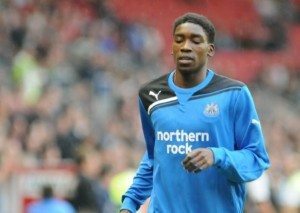 Not wanting to pick out individuals but Sammy Ameobi was shocking tonight, almost every time the ball was played to him we lost possession. Newcastle could be a decent team with everybody available but when that isn’t the case we look a very average team and that is being kind. Marveaux took his goal well but failed to impose himself otherwise, while in all honesty the Portuguese equaliser was no more than they deserved. Let’s hope Jonas and Cheick Tiote are all revved up for Sunday or else we could look real relegation battlers come Monday.